A sense of community, cultivated by locals. It’s a happening place, with just the right amount of activity. There’s always something going on in and around the District, from events and tastings, to festivals and meetups. Come celebrate some Valentine’s vibes with us, cacao, Michelle & heart-opening yoga to celebrate who we should love the most- OURSELVES. Ceremonial cacao is a beautiful heart opening plant medicine. Nicknamed the “Plant of the Gods,” the cacao, we refer to is “she” is used in many cultures to deepen the connection to spirit. Cacao is pure, soft, bitter-sweet and deep. We will be drinking raw, unprocessed ceremonial grade cacao from Ecuador and then enjoying a 60 minute slow flow yoga class celebrating the love we must nurture for ourselves. In a world filled with negative narratives and self-talk, come be enveloped in LOVE. But back to the cacao…Chocolate comes from cacao, only it is processed to strip away the bitter taste, and along with that, all of the medicinal and health benefits. Medicinal benefits are many, and we recommend that you read further online if you are interested. Why is Michelle bringing it into a ceremony? One of the many benefits of cacao is that it helps elevate your senses and deepen your connection — an expansion, if you will. Cacao helps to move your blood through the body at higher rate, up to 40% for some, which means you may feel a little elevated (or high-ish). But note, cacao is not psychoactive, like other plant medicines, not to worry. 🙂 Cacao also elevates your serotonin levels, which means you may feel very relaxed and mellow. Cacao is further considered a heart opener. Important Notes: It is very important to drink a lot of water after imbibing in our ceremonial grade cacao. If you are on anti-depressants, have epileptic episodes, have low blood pressure, or are pregnant/nursing, please let me know so we can adjust your dose of cacao that evening. Cacao is perfectly safe, we just want to make sure you are enjoying your experience. If you are concerned by the text above, refer to your experiences with chocolate…. if you do not have adverse reactions to chocolate, you should be just fine. As always, with all ceremonies, brining a journal, favorite crystal, water, blanket all recommended for the journey. For this ceremony, it is important to also bring your own favorite tea or coffee cup. We will be drinking about 4 ounces of cacao. No need to bring your largest cup, unless it has special meaning to you. 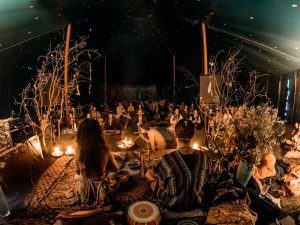 Ticket for cacao, ceremony, and yoga is $33. Tickets are non-refundable. By purchasing, you are agreeing to our purchase terms and conditions. Please make every effort to attend. We are holding space and materials for you.